I think this is like several works of 'flash fiction' in one book (except that it is non-fiction) and the diary format enables the writer to do that. The anecdotes elicit a range of responses. Some of them will cause you to piss yourself laughing (incontinence pads are available). Others will make you think about the ridiculous hours junior hospital doctors are working and wonder whether this is good for patient safety (it would seem not). The argument that 'it was ever thus' gets short shrift. There are stories which will simply make you wince on behalf of the patients and some that are heart-breaking as well. I enjoyed reading this book and I will not be giving any spoilers. I would just suggest that Adam Kay doesn't become an advertising copywriter for Jack Daniels or a bodyguard for Jeremy Hunt. 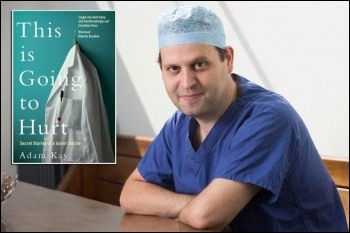 Adam Kay defends the NHS against the privatisers and he does it in a witty and engaging way.